OK, here's an interesting 1st layer. This is on my new UM2. This is my backup piece of glass that was the original glass for mu older UM2. By the time it started the bottom right, I turned the bed screws out some for a thicker print, so the bottom right object is a little thicker. This glass has several layers of hair spray on it. I'm thinking that weeks of my scraping off the hairspray with a razor blade and applying new hairspray have created the hills on the glass. But at such perfectly straight lines??? Still, a very strange initial layer. I will clean the glass, and reprint this exact same object to do a comparison. It could be some sort of oddity in the glass - slight surface eccentricity. Or perhaps it's something about the printer? It's consistent with the head moving higher or lower as it moves in the x-direction. And it seems quite a regular period, so I wonder if it's due to an eccentric pulley, or bent rod? Yeah, I cleaned the brand new glass that came with it, put a very LIGHT coat of hairspray on, and it looks like it's doing the same thing! Pull the glass off and hold a ruler or some other straight rigid edge to the surface. If its flat then Illuminarti is probably right, you have a bowed rod or rods causing the head to rise and fall when the linear bearing is sitting near the middle of that rod. Move the head end to end from the corners on each axis with and pay attention to the middle of the rods that are spinning. Also its probably easier to clean that hair-spray off the glass with a wet paper towel rather than trying to scrape it off. I run my plate under water to clean off the glue stick occasionally. Just make sure the plate is cooled to room temp first so you don't thermally shock it and potentially cause it to crack. Maybe try to turn the glass around. IMHO if there is a irregularity in the surface of the glass, than it should be only on one side. The first layer has it's own setting in Cura. It is independent from the normal layer hight. I have good results with the first layer to be a multiple of the normal layer hight. But the relation of the values is not really relevant. 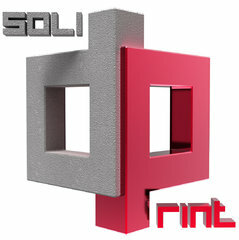 EDIT: @solid print 3D: You can follow this thread (Button on the top), than you will get informed on every new posting in this thread. The steel collar used to tighten the heater block to the aluminum plate was loose, I mean LOOSE! I was getting read to pull my hair out, and while trying to level the bed, I saw a slight movement in the extruder nozzle. " I thought to myself "WHUUUUUT?!" There was a tiny gap between the teflon and the steel collar, so I overlooked it, but after tightening it down, the teflon moved up about 3mm, so yeah, it was loose. Nice job. Check this one off the list. Scratch that! After tightening the loose steel collar, I also re-leveled the bed, and changed the first layer height to .3mm in Cura becasue of some advice from iluminarti. I've been printing a couple of the same small objects in the center of the platform with .3mm first layer, and the problem looked like it went away. I'd like to post some pictures, but thought I'd ask here first... maybe there's a pattern I can print, or something, that diagnoses the problem. I started another large square, but it just looks like the original image I posted. When I first took my hot end apart I noticed the loose steel collar and tightened it as well. I printed with it tightened for a little bit but I've since put it back. The PTFE spacer will sit flush on the nozzle regardless if the collar is tight or loose because of the sprint tension. There are a couple reasons why I set it back and one is because with the collar tight it raised the nozzle up to far for my liking and another reason is because this way there is room for the nozzle to move should there be irregularities in the glass or in your case a bent rod. I'm not sure but it would seem to me that if the nozzle was being forced into the glass for whatever reason it would be good to have some give there. Getting new rods, as it appears some of the rods are not true. There are grinding marks on the rods as well from manufacturing. Once Simon sends the new rods, I'm sure all will be well. I have one printer with the collar tightened all the way down, and one printer where it is relaxed. I will run them like this for a while and see results for myself first hand. I did just have to debur my newest UM2's teflon for the second time! no big deal. Just wished I had a bag of the darn things so I can just put a fresh one on every time I have the head apart.